Looking for Christmas angel craft patterns? Try this gold star angel ornament! 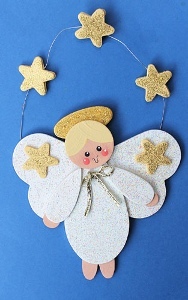 This handpainted angel Christmas ornament is simple to make, and it'll look great on your tree. Paint wood pieces as follows: Extra large teardrops, medium teardrops, and extra large hearts, Snow White; large oval and stars, French Vanilla; small ovals, one large circle, and two small circles, Flesh Tone. Let all dry. Re-paint front of large oval Splendid Gold, Snow White pieces with Crystal Craft Twinkles, and stars with Gold Craft Twinkles. Paint hair French Vanilla on large circle. Using end of brush handle, make two Coral Blush dots for cheeks and two Lamp Black dots for eyes. Let dry. Use toothpick to make small Snow White dots on eyes and cheeks. Draw mouth with marker. Glue head at top of teardrop body. Glue Splendid Gold oval behind head at top for halo. Glue small teardrop arms to front. Glue one small circle behind end of each arm for hands. Curve wire; glue two stars together on either side of wire, sandwiching wire between. Glue ends of the wire to back of angel wings. Glue remaining two stars to front. Paint edges of wood pieces first, then place on wax paper. Paint both sides of each piece before assembling. This Gold Star Angel Ornament is 100% pure sweetness!!! I have a group of twenty women that I get together with once a month. For the month of December we have a Christmas party that includes an ornament exchange. I think this angel is going as my contribution this year! I've been looking for something to create to soothe my holiday stress and this will fit the bill. Thanks sooooo much for the inspiration!!! Cute little project that kids would love to make! I have seen these little wooden shapes at buck and hobby stores and they are pretty reasonably priced! You can have these adorable little angels painted with different hair and skin tones and even add some tinsel sparkle garland to the halo and stars for some extra bling and sparkle! Great creative idea! I have been wanting to make this since I found it last fall. Where can I buy the woodsie without having to buy a package with a bunch of different shapes and sizes that I don't need or want for that matter? Any help would be greatly appreciated. Also maybe it would be easier if the dimensions of the woodsies were included instead of small/ large/x-large.